We set out from San Diego on November 19, 2015 with the thought that we would go to Panama. 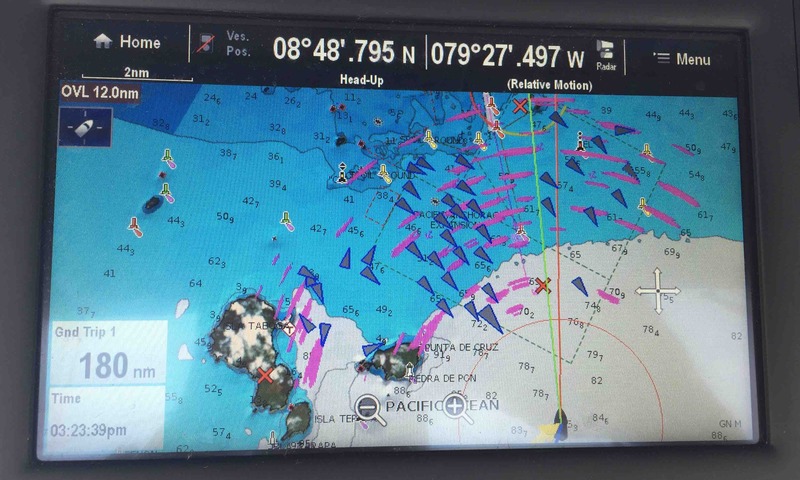 On May 26th after 189 days and 3,256 nautical miles we pulled in at La Playita Marina in Panama City. Oh ya, we made it! This last leg was part luck and part frustration. The lucky part was with the weather and not getting tangled in a long line. The frustration was having to pass by many pretty anchorages to stay lucky with the weather. While in Costa Rica the weather was really unsettled with thunder storms occurring daily. 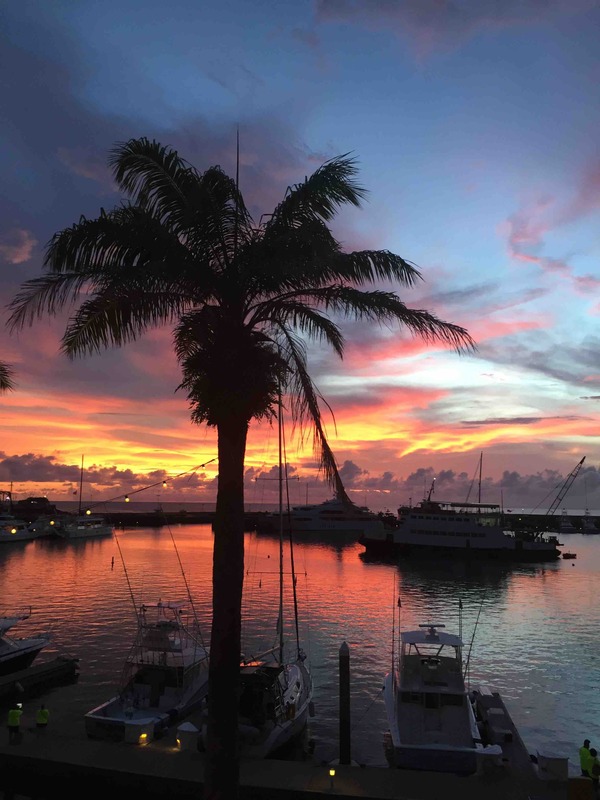 When a break in the storms appeared, we quickly checked out of the country and set off right at dinner time enjoying the fresh breeze after being in the hot marina for a few weeks. We crossed into Panama at midnight and had a lightening show with no rain the entire night. The next morning we encountered the first of many long lines put out by the Panamanian fishermen. Apparently fishermen in Panama do not expect boats to be sailing out on the ocean since they don’t hang around to warn off unsuspecting sailors. There was little to no wind so with the engine running luck was on our side several times as we spotted some of these lines within seconds of running them over. 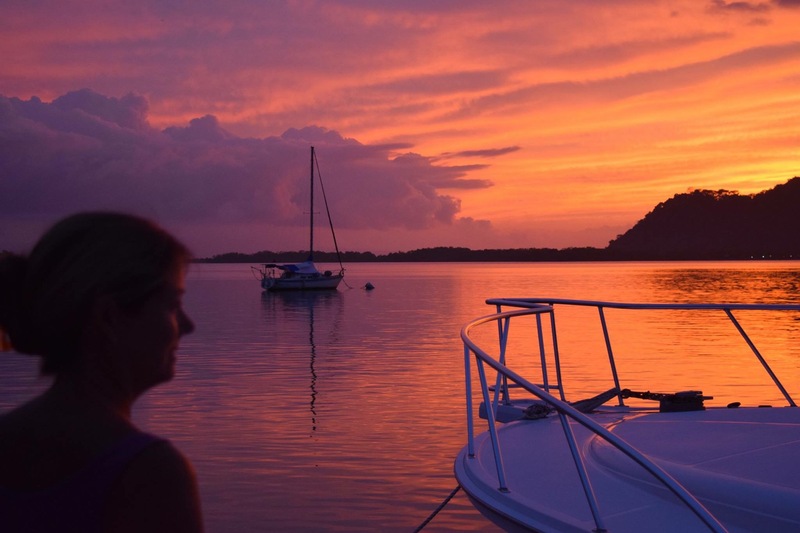 With storms in the area, we decided to stop and anchor our second night at Isla Cebaco. It had been a long time since we were able to enjoy eating outside watching the sunset with a cool breeze. We had thunder but the storm passed our anchorage allowing us to keep the hatches open all night. We were up early the next morning for the final overnight leg to Panama City. We knew Punta Mala is reported to be the single most congested point in North America and the Pacific due to shipping traffic going to and from the canal. It also experiences extreme currents that would be going against us and our arrival there would be around midnight. 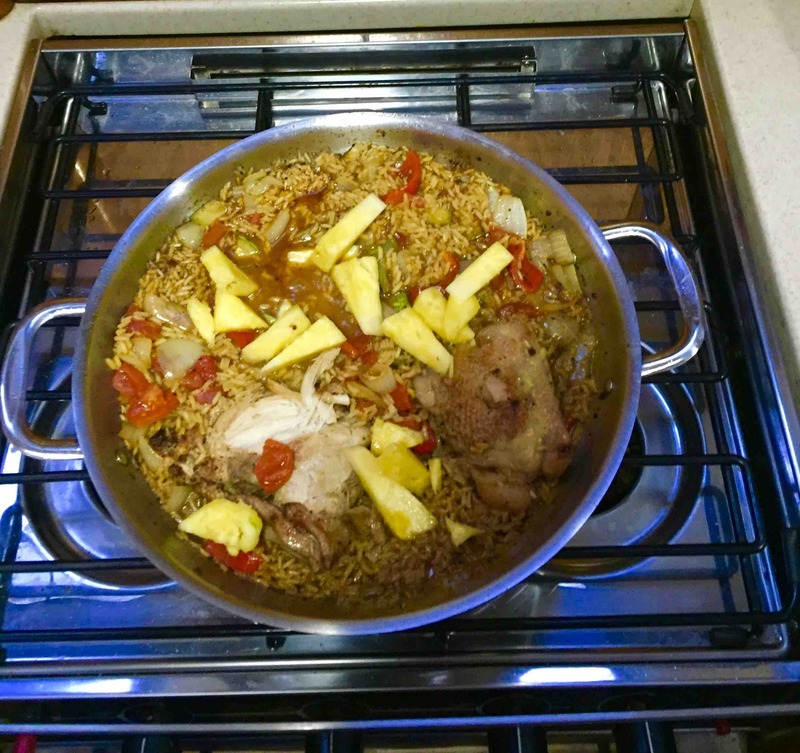 So to fuel us up, Gary spent an hour in the galley cooking up a delicious paella. Right as we sat down in the cockpit to eat, the skies opened up. Ugh! As we were nearing Punta Mala, we were at the southern most point Sereno II will be in the Pacific Ocean at approximately 07 08’.876”N latitude 080 43.410”W longitude. Overlooking another quick downpour of rain, getting the jib sheets tangled, choppy seas, and a drop in boat speed from 6.8 knots down to 3.7, rounding Punta Mala was not bad. Only one ship passed us and he was twenty miles away. From that point we didn’t see any ship traffic in the shipping lanes leading to the canal for another 10 hours. We envisioned something like the I5 freeway in LA at midnight! Had me thinking we screwed up on our navigation and we were in the wrong bay. So while sailing through Panama Bay was a bit more laid back then we imagined, the skies were clear and it was a beautiful day. That is until we were ten miles out from the canal zone. Thats when the clouds rolled in and we got rained on long enough to get us and the boat wet. It was a bummer because we missed out on a great view of the Bridge of the America’s and the downtown skyline. Upon entering the canal region you must contact Port Control to seek permission to enter. After we were granted permission to head to our marina, we set a course in the general direction we needed to go still an hour away. Thirty minutes later Port Control hailed us to make sure we knew we were heading on the wrong side of the causeway. We still hadn’t made our final course adjustment but we quickly did so. Felt a little creepy having someone watching our every move. The yellow arrow is pointing to Sereno II and the red line indicates our course. The triangles are ships at anchor waiting to transit or in a few cases were under way. The pink areas represent rain. The red X closest to us is the beginning of the channel to the canal. The red X further away is the marina we were headed to. Okay boring no longer! Before we left Golfito the boats from the Clipper Around the World race came in to fuel up on the Seattle to Panama leg. There are twelve boats total and we saw six. The crew were varied in age many with British and Aussie accents. We had hoped to see them out on the water but I’m sure they set a course for speed while we were setting a course to stay out of a storm brewing offshore. Marina Pez Vela was a nice change from our last two stops. We had five restaurants on site, the town of Quepos was within walking distance and we had easy bus transportation out to Manuel Antonio National Park, our main reason for stopping here. Sunset over Marina Pez Vela. That is Sereno II at the bottom of the picture, middle boat. 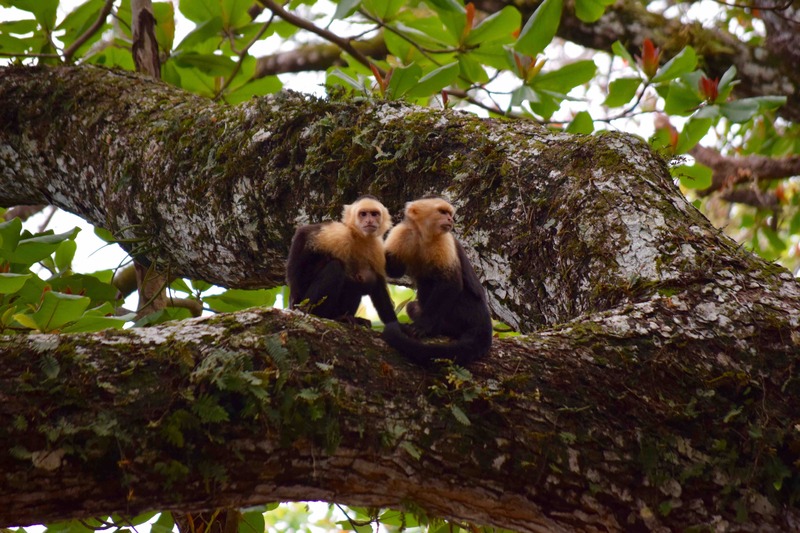 With its groomed trails and monkey sightings Manuel Antonio National Park is popular and can be crowded on some of the trails. It was fun to watch the monkeys but I really wish we had spotted a Toucan bird. 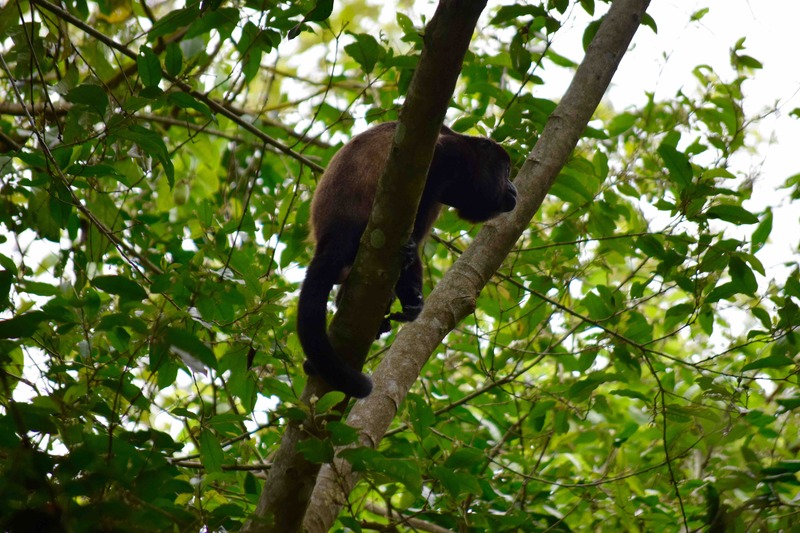 This is a Howler monkey we caught sight of. They make an indescribable noise. 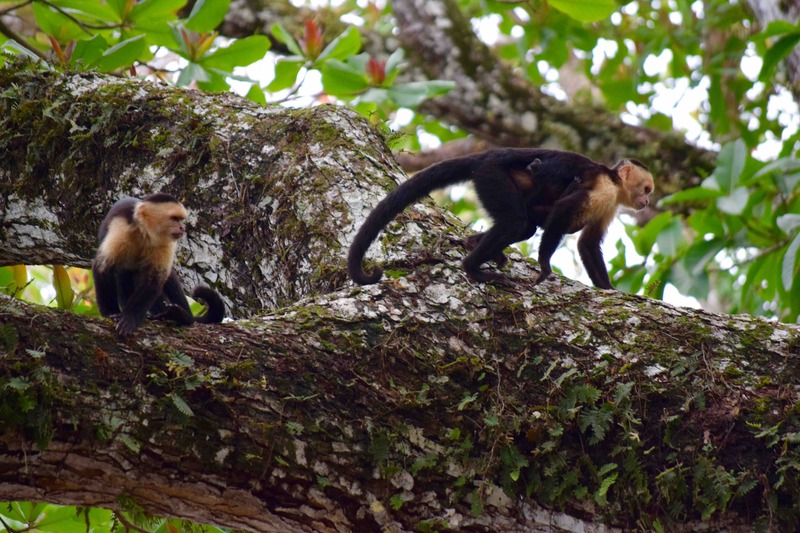 This is a White-headed Capuchin. Look carefully at the one walking and you will see the hands and feet of her baby. Here is another shot of the same two. Look carefully at the one on the left and you will see the babies ear and outline of the head. Glad we did the park but we both had more fun on our rain forest hike at Arenal when we didn’t see another sole. We would have loved to stay longer in the area but this marina is pricey so in a light rain with bathing suits on we set off early in the morning on a short nine hour hop over to Drakes Bay hoping the predictions for a calm anchorage would hold true. The anchorages along Costa Rica can be rolly. Drakes Bay is very exposed to the sea but we lucked out and had dinner out in the cockpit along with a fairly calm night. It’s nice when the predictions are accurate. We did have rain move through overnight requiring is to close all the hatches. When at anchor we are on battery power so no air conditioning just a couple fans. It was a bit warm but we got more sleep then we would have on an overnight passage. 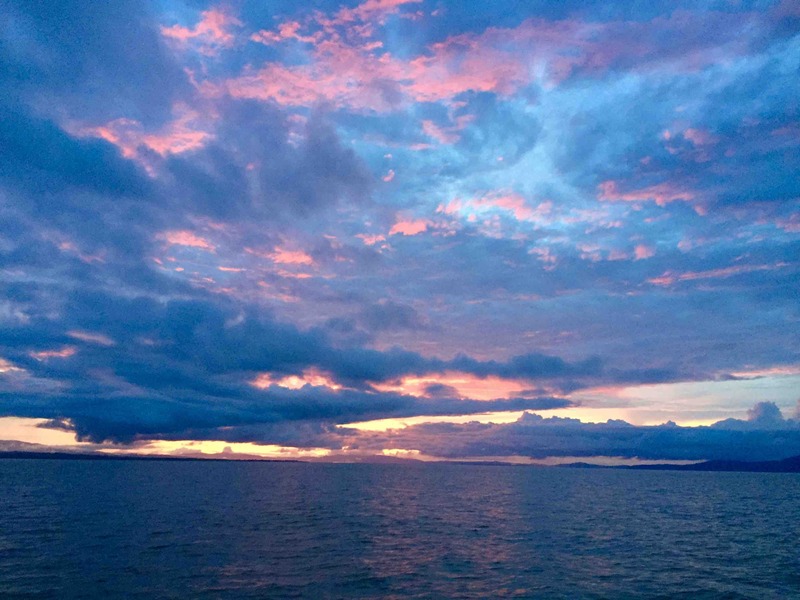 We raised anchor just as the sun was rising and headed out 67 nm for Golfito our last stop in Costa Rica. It was a calm day and we stayed dry until ten minutes before we pulled into our slip. Mother Nature decided to remind us who is boss and greeted us with a downpour as we pulled in to tie up. Luckily the harbor master and two of his staff were there to help us. I’m finishing up this post enjoying a cocktail and air conditioning while it rains cats and dogs out there. Hoping it slows down a bit because neither of us feels like cooking! Happy hour and dinner awaits just a stones throw away. We must be crazy! I’ve said this to myself several times over the past two years. Gary and I are fair weather conservative cruisers. If the weather and sea conditions aren’t good we ain’t going. We have no desire to scare ourselves silly. We are now in the single digit latitudes which means we are pretty close to the equater and it is stinking hot and humid (yah for air conditioning) with a lot of lightening and thunder thrown in during what is now the rainy season. We have a healthy respect for lightening having grown up in New Jersey and spent a fair amount of time in Florida. We’ve kept moving south to get out of the hurricane box which puts us in one of the top places for lightening. For those wishing they could trade places with us, consider this. 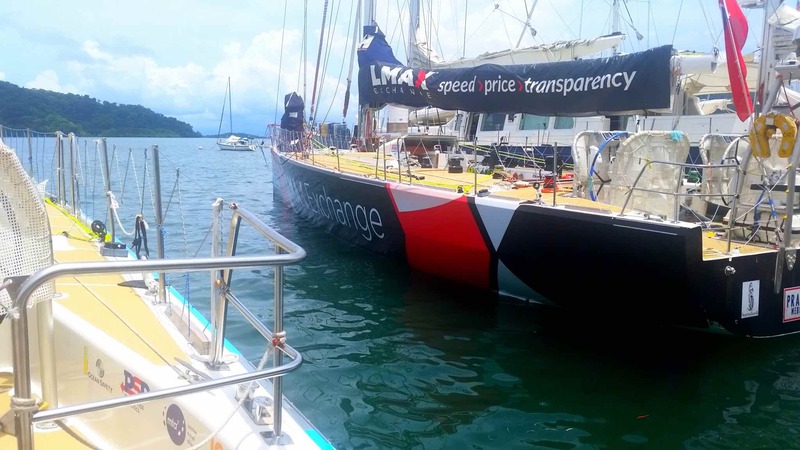 You are on a 28 hour passage in a 41 foot sailboat 10 miles off the coast of Costa Rica. What is predicted to be a calm day turns ugly with confused seas and constant lightening from early afternoon until 4:00 am the next day. With only one hour of sleep your eyes are glued to the radar so you can weave around rain cells hoping to stay dry and avoid a lightening strike to the 65 foot lightening rod (aka mast) attached to your boat. If that happens all your electronics will be fried. While the cockpit is fully covered, it is canvas. So you and everything in the cockpit is soaking wet. The rain I can handle. The lightening is flat out scary. Crazy? Most definitely! But the next day when we are out exploring our new ‘home’ for awhile the scary passage is filed under lessons learned. Most of our posts are about the good, cocktails and beautiful destinations. A lot of work goes into making the good happen, which is affectionately referred to by cruisers as ‘fixing your boat in exotic locations’. So I thought I would share a little about the bad because after all, this is our day-to-day life we are not on vacation. Now the ugly would be sharing how the hose that flushes the waste tank was clogged last week but I think I’ll spare you those details 🙂 .